Happy springtime! It�s still two months before we�ll see flowers in the arctic, but by late March, an early melt was underway. The ground is still covered with snow, and there�s been plenty of new snow, but temperatures above freezing have rendered trails and streams dangerous for travel. Meanwhile, our 25,000 Watt signal keeps beaming God�s Love throughout a vast region of western Alaska. We�ve been too busy to conduct an official survey, but reports from our fringe areas, hundreds of miles away, tell us that our power increase has made a significant improvement in our signal. Thank you for your prayers and your financial help, without which our work would not be possible. OOPS: Last month, we wrote incorrectly that KNOM airs 1,000 inspirational spots every month. The true number is 2,800 inspirational spots per month! 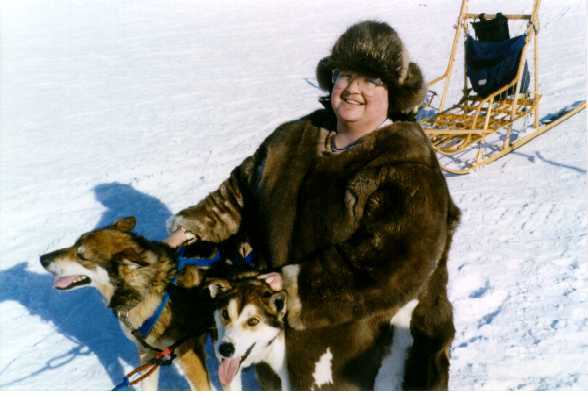 top Linda Raab is one of the best dog-gone reporters around, and we thank her for making a special trip to Nome to help with Iditarod Race coverage, for the tenth time. The race attracts an even larger listener-ship to KNOM than usual, with bone-crunching work for every-one on the staff. Thanks, Linda! INSPIRATIONAL SPOT: Lord, help me to be the person my dog thinks I am. top HOMELESS? Two years ago, when someone proposed a homeless shelter for Nome, many laughed. After all, how could a homeless person survive in the arctic? Nobody is laughing today, as Nome�s shelter houses an average of thirty homeless men every night. Manager Tom Busch explored this little-discussed topic in a special call-in program over KNOM in early March that evoked some heart-wrenching calls, two from village men who have straightened out previously troubled lives. BUTTON UP! (Left) If you�re a broadcast engineer, you�ll recognize the remote control which Tom Busch is using, with his finger on the "up" button. The unit sends information from the tundra transmitter location back to town, and allows us to monitor voltages and temperatures and control the transmitter from three miles away. We happily report that since we raised our power to 25,000 Watts in early February, we have experienced no problems with the new system whatsoever. Again, we thank all of our benefactors for your wonderful support! INSPIRATIONAL SPOT: Father, let me hold Your Hand, and, like a child, walk with me all of my days secure in Your Love and Strength. top 25 YEARS AGO: In April 1973, Eskimo fox hunters from the Russian Far East met with Diomede Islanders on the Bering Strait ice at the International Dateline, exchanging family news and gossip, dried fish, tobacco, chewing gum, sewing needles and other small gifts. The Natives on both sides of the border are related, though international tensions prevented formal contact from 1947 until the fall of the Iron Curtain. 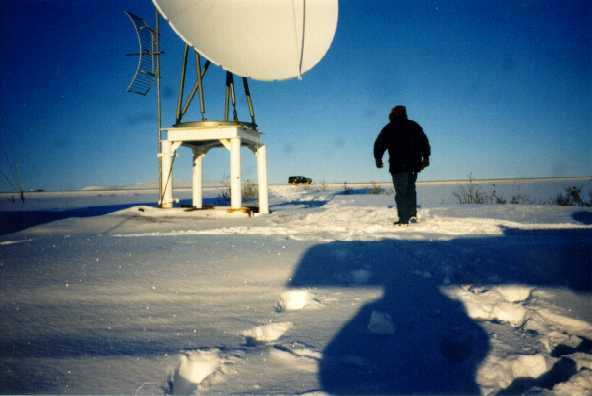 While KNOM exists primarily to serve Alaskan Eskimos and Athabascan Indians in remote villages on this side of the Dateline, our signal does penetrate deep into Russia and has been enjoyed and appreciated there since we signed on in 1971. NEWS HOUND: As we mentioned last month, this used to be "suicide season" in rural Alaska, possibly due to the dramatic change in sunlight hours, and there�s no doubt that the Iditarod Race has made a wonderful positive change. Thus, as the winning musher approaches, KNOM has always found itself putting almost all of its resources into covering the race for two weeks. Can you imagine how much effort it takes to report the progress of every one of fifty mushers and then interview every single one live at the finish line? Usually, we suspend local news for a few days. Thanks to the indefatigable Les Brown, however, that was not the case this year. 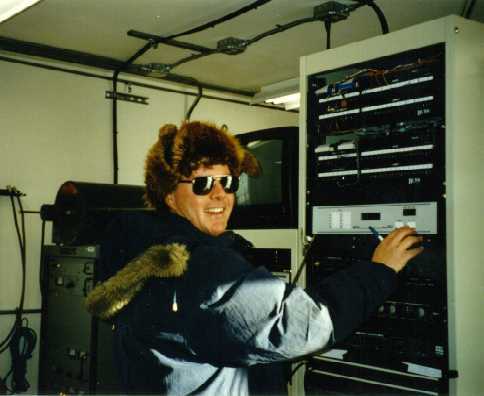 Despite the absence of news director Paul Korchin (who reported the 1,000-mile trail by small plane) and the tornado of Iditarod activity, Les also found the energy this year to keep the KNOM news department running full bore, writing and producing (non-dog) news at an incredible rate. Thanks, Les. And hats are off to everyone on the hardworking KNOM crew! DO YOU HAVE IDEAS, favorite spiritual thoughts and prayers, for Inspirational Spots? Please send them to us! It�s 3½ miles from the town of Nome to the KNOM transmitter, but the toughest part is the last 400 feet . Our narrow road that connects to the gravel highway drifts over after the first autumn snow and is impassible except by foot, and it�s not uncommon to sink to your knees with every step! INSPIRATIONAL SPOT: Faith is a natural thing. You get on a plane, snap together the seat belt, while the plane carries you miles into the sky at several hundred miles an hour, without worry. You fall asleep. You have faith! All of us have faith. The question is not whether or not we have it, it�s where are you going to put it?